DRP-300 is a 2.5 day intermediate level course with a 100 multiple choice question examination on the last day. Each candidate must achieve a score of 75% or higher to be eligible to apply for the DR Certified Specialist (DRCS) Certification. This course is designed and developed for IT Disaster Recovery (DR) Managers and Planners, IT Professionals dealing with specific area within the DR planning process, and any IT professional embarking on their IT Disaster Recovery Plan (DRP) career. Candidates will be introduced to the key concepts of developing business continuity and disaster recovery strategies, design and implementation of DR plans, and preparing and conducting awareness and training programmes. 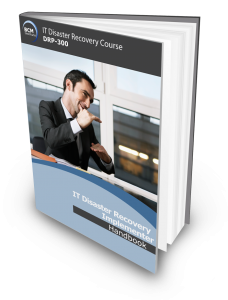 This course is a pre-requisite course for the DRP-400 course. DR Certified Specialist (DRCS) Certification is awarded to participants who successfully completed and passed the Qualifying DRCS examination attached to the course, sends in an application detailing at least 1 year of DR experience , make the application processing fee payment of SGD75 and satisfies and meets the experience requirements of the independent certification body. Understand the conduct of the application impact analysis used to identify critical IT and technology resources to support key users. Be able to relate to Recovery Objectives and identify the recovery solutions. Develop and evaluate effectiveness of related recovery procedures. Walkthrough the tests and exercises for IT disaster recovery. DRP-300 is designed for System Administrators and Managers; Database Managers and Administrators; DR Coordinators; Project Managers involved in application development, systems and network implementation and support; systems support engineers and consultants. This course incorporates a 100-Multiple Choice Question electronic exam the next day. The duration of the examination is 2 and 1/2 hour. Candidates who achieve with a passing score of 75% or higher are eligible to apply for the BCM Institute’s Disaster Recovery Certified Specialist (DRCS) accreditation. The examination fee is included as part of the course fee. SGD75 (Certification Fees are to be paid during application after participants has passed their Qualifying DRCS exam). The course fee includes the DRCS examination fee.